When I first discovered the rampant theft of my images, I never dreamed the frustrating hours it would take to regain control. There were nights I seriously questioned whether or not I’d actually survive this hit. But with all the support and encouragement I received along the way (thank you! ), hope soon replaced the feelings of despair and I gained a strength I didn’t know I had. Over these past three weeks, I have become well-versed in finding stolen images and how to use WHOIS to locate the proper folks with whom to make a claim. I have filed countless DMCA forms, have sent numerous takedown notices and have gained invaluable knowledge about image protection and my rights as an artist. I’ve come to realize the only person who can truly protect my images is ME and I have begun taking the necessary steps to do so. Though I still have weeks of work ahead of me, the rose-colored glasses are off, my friends, and I am indeed, wide awake. At last count (and I find infringements every day), over 85 different images were being used without my knowledge or permission. The actual number of violations, however, lies somewhere in the 250 range since many images were found on multiple sites all across the United States and throughout the world. While some infractions were minor (e.g., image posted on a blog or used as an avatar), others were much more serious (images displayed on commercial sites, images used to sell products, images used in YouTube videos, images used as backgrounds, images used in online news articles, images posted on a photography tutorial site, images altered and so on). And, yes, there still remains the issue of the playground image used on an EP cover by a UK artist (the toughest pill of all). I estimate that I’ve been able to get 95% of the images removed. Some, I may never get removed. New motto: learn, accept, protect, move on. A hearty THANK YOU! goes out to the following sites: Google, Tumblr, YouTube, Polyvore, Instagram, Wikispaces, Facebook, WordPress and GoDaddy (as well as other countless hosting sites here and abroad) who take copyright violation seriously and acted promptly on my behalf. There is one particular infraction, however, that I feel compelled to single out since the response by the thief is one that I think you all should hear. It started out innocently enough (as things always do). Hmmm… how… very… interesting. Ladywildlife had taken it upon herself to offer MY copyrighted Mourning Dove image to others to download/print and use for FREE without MY permission or knowledge and yet, at the same time, appeared to have gone to great length to protect “her” site’s content. You can imagine my reaction. I clicked on “CONTACT ME” and filled in the form requesting my image be removed, pointing out the irony of the site’s copyright statement. When I encountered difficulty in submitting said form (couldn’t confirm it was filed), I performed a WHOIS search the following day and located an e-mail address for the site’s webmaster. 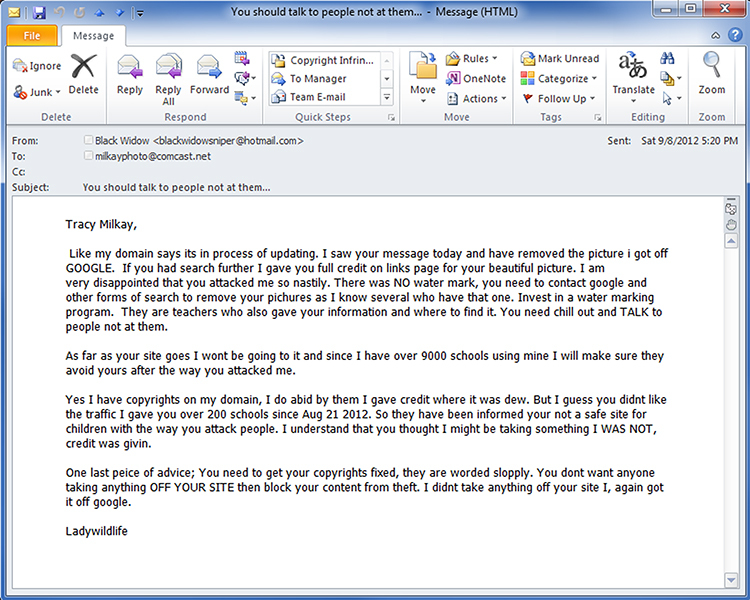 I then sent a DMCA notice to the webmaster claiming ownership of the image and requesting its immediate removal. Seriously? You take my image and when I ask for it to be removed, THIS is the response I get? First, I did not, by any means, attack ladywildlife. I used the contact form contained on her site and requested my copyrighted image to be removed. When I feared the request wasn’t going through via that form, I followed up with a DMCA notice to the webmaster which is in my rights to do so (and has proven to be very effective). As an aside, I do not feel it necessary to be nice to those who take my creative work without my consent. Second, I found no link (or links page) or credit back to me or my blog. No idea what ladywildlife is referring to here. Third, what on earth gives ladywildlife the right to declare my site as not safe for children? (Can you say, libel?) This couldn’t be further from the truth. However, I am glad viewers of ladywildlife will not be visiting my site since the only reason they would be doing so would be to grab wildlife images for their use without my knowledge. No thank you. Fourth, ladywildlife, you most certainly did take my image. For someone who claims to be well-versed in copyright law, you have it all wrong. Finding images via a Google image search does not make them free to use nor absolve you from copyright infringement. Furthermore, when you click on an image in Google, the following statement appears in the side-bar: “Images may be subject to copyright.” So, if my visible copyright stamp wasn’t enough of an indication the image was protected, Google was attempting to inform you to do your homework before downloading and using said image. Fifth, with regards to the copyright statement on my site, what you call ‘sloppy wording’ is the standard verbiage from the US Copyright Office and is actually, not even necessary to protect my site’s content. (All that is required is “© 2009-2012 Tracy Milkay/Milkay Photography All rights reserved”). However, you will notice that I have since expanded my statement to be crystal clear so there is no room for confusion. Sixth, thank you for the reminder about contacting the various search engines to get the older, un-watermarked versions of my images removed from searches and cache. This was initially lower down on my ‘to-do’ list but now I understand the importance of sending such requests at the same time I implement my image changes. A win-win for me. So there it is, folks. The above example is by far the most extreme case I have encountered to date. Fortunately, the majority of responses I’ve received have fallen to the other end of the spectrum, from honorable folks who’ve apologized for using an image of mine and have either removed it per my request or provided the proper credit/link. I understand image theft is a widespread problem, experienced by artists all over the internet and my situation is nothing new. The internet is indeed, a complicated place (it is not called a “web” for nothing). To artists, do everything you can to protect your work! To the rest of the community, please respect and support the work of writers, photographers, graphic designers, painters, etc., and think before you download/use content you find on the internet. There are working artists behind those creative works who are trying to make a living and when their work is taken, without their permission or knowledge and with no compensation back to them, how can they continue to do so? As always, your comments and ideas are welcome. I do not profess to know how to resolve this problem but hopefully, by simply opening up this dialog, together we can raise awareness. Spread the word.